It is very important to complete your author page in Bubok because it contains information about you and your book. It also works as cover letter to any reader that checks your site. 1. Log in with with your username and password. 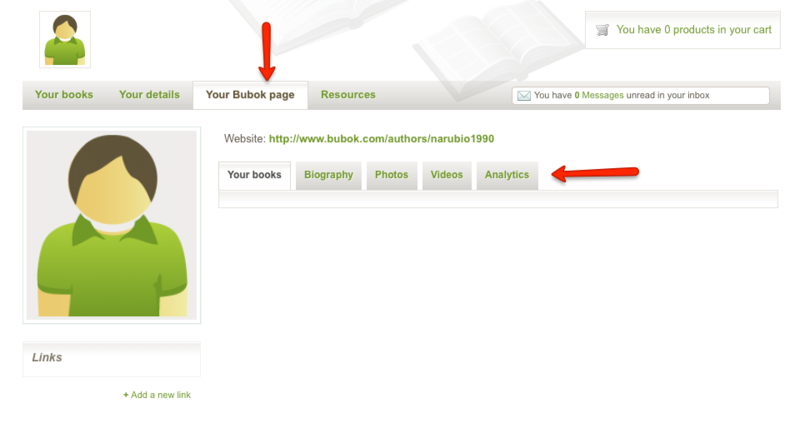 Once inside your author panel, click on the link 'your Bubok page'. 2. Find the option to write your biography. It must have at least 300 words. Try to make it as appealing as possible, and careful about your writing! First impressions are crucial. 3. Next, in 'photos' you can link your Flickr pictures to your Bubok's page. Please make sure those pictures are public and visible on your profile. Just copy your Flickr id to link your profiles. 4. In 'videos' It is possible to link videos you uploaded in Youtube or Google to your author profile. Just copy the link of the desired videos and paste it where specified in your author area. This tool is very useful to show any book trailer, presentation or interview that has been published about your work. 5. Now configure the Analytics code for your book. This tool is really useful to monitor and analyze the amount of visits that your book gets. To get your Analytics code you need to sign up in Google Analytics and configure your personal account. There you will find a code to attach in other pages. 6. You can also link your Bubok profile with your Facebook and Twitter accounts. You just have to put the id of your respective accounts in the appropriate box. 7. Finally, do not forget to upload your profile picture. If you do not want to use your photo, you can put your brand logo. To change the picture, you just have to click on 'your data' and then ‘change'. Images should have a maximum size of 400x400px. If you had any questions, please contact us and we ry to help as soon as possible.